Do you have a veteran in the family? Imagine their passing without their story being properly recorded. It doesn't bare thinking about does it? But we can help. Using National Archives' footage and historical photographs, as well as interviews of the person and their personal photographs, memorabilia and keepsakes, we create "Ken Burns" style veterans' personal history documentaries. We have interviewed veterans from Vietnam and Korea and from Pearl Harbor, Guadalcanal, Tarawa, New Guinea, Okinawa and Japan - wartime and occupation forces. 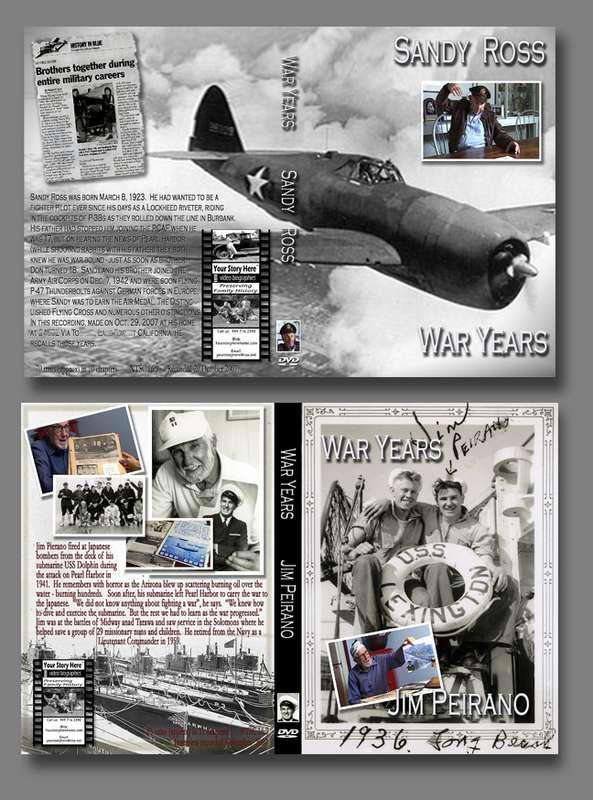 We have documented on video veterans' stories from Europe in WWII. One of our clients was a Jewish GI who was part of the invasion forces in Europe. He memorized the Lord's Prayer - just in case he was captured! We have recorded on video soldiers' stories from Marine actions in China - helping the Nationalists. We have interviewed veterans who fought in the Korean War and men who fought in the Vietnam war. One old soldier remembers being called a "baby killer" while visiting Haight-Ashbury in the late 60s. We have also recorded stories to video of Marines, and stories of men who served in the Infantry, Navy and Air Force. Not just their war service but their other careers, their forebears and loved ones and their later lives. 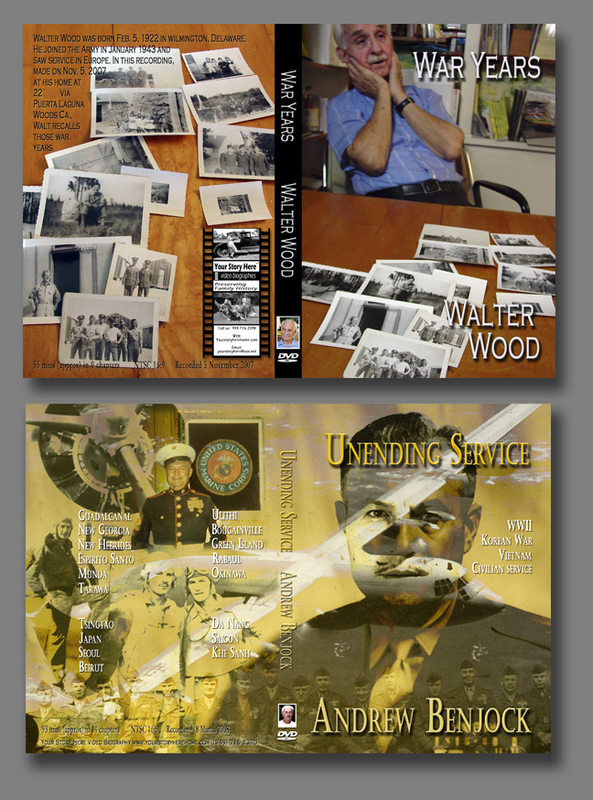 And we have documented the personal history of the many who were left behind - lots of whom directly assisted the war effort and all of whom suffered the absence of loved ones, sometimes permanently. In every case we bring the greatest care to the task of preserving on DVD the stories of these most important people. We record and help tell soldiers' stories. Our older veterans lived through the most extraordinary (and bloody) century in human history. And our recent have veterans faced some of the most difficult conditions imaginable. Wars in Korea and Vietnam, Iraq and Afghanistan, the Pacific and in Europe, to say nothing of other theaters where men and women served our country, have all left unique and indelible marks. Some veterans have recorded their stories to video. Many have not. 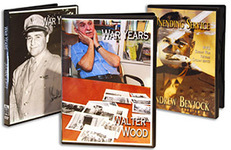 Your Story Here Video Biography is committed to capturing our veterans' stories in personal history video documentaries. Veterans' videos and veterans' personal history documentaries. 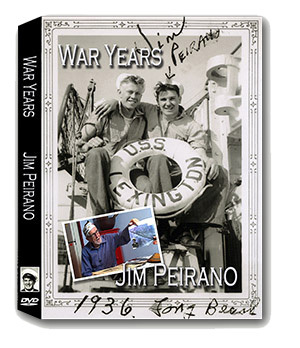 The incredible story of Jim Peirano from Orange County whose veteran's story we had the honor to record and help tell. The release in 2010 of "The Pacific" - the Spielberg/Hanks' HBO 10-part veterans video about ordinary soldiers fighting the Japanese in WWII - put the spotlight back on "The Greatest Generation". With around a thousand WWII war veterans now dying every day, it also challenged us to ask if we are doing enough to save our own families' old soldiers' stories, by way of video or oral history interviews. How do you tell the story of a war? Thucydides and Xenophon wrote of kings and campaigns and the rising glory of the ancient Greeks. And ever since those Pre-Christian times the "great man" theory of history has largely held sway. But battles are fought by ordinary men and women; and especially since the 20th Century, sacrifice and destruction in war have been painfully shared by all of society. So a narrative which focuses on the geniuses running the show isn't quite the full picture. As a result, recent documentary and dramatic veterans videos have focused on the soldier (think "Dunkirk", "Band of Brothers", "Saving Private Ryan") and on the home front (think Ken Burns' "The War"). And this is how it should be. The larger purpose of battles and war must never be ignored, we must be clear on the geography, and the political leadership deserves air time - but it is the story of the common soldier which commands our attention. Because the common soldier is us - our brothers and sisters, our parents and grandparents. Their sacrifice is our sacrifice. One of the best of the recent crop of veterans' video - "The Pacific" - carries on this new, more democratic, movement and the stories it tells are based on the real life experiences of actual soldiers serving during World War II in the 1st Division. And for many veterans in the audience, many of the older viewers especially, the video will bring back painful memories of terrible privations and lost comrades. And it will raise the question of whether we have done enough to preserve the stories of the old soldiers close to us. And since 2007, the Veterans History Project - an initiative of the Library of Congress and the American Folklore Center - has been collecting, preserving, and making available the personal accounts of all American war veterans "so that future generations may hear directly from veterans and better understand the realities of war". The Project encourages the submission of personal accounts, interviews, veterans audio, veterans video, written memoirs and photos and documents. And they provide a "Field Kit" to assist interviews and a "Memoir Guidelines" for those veterans writing their own account. The Veterans History Project also welcomes stories from the "home front". ​You may watch the now-classic WWII series "The Pacific" - $200 million for its making - and marvel at the sublime agony of battle, and the day-to-day challenge of surviving on hot, barren, volcanic islands whose names are largely forgotten and whose locations the folks at home - and even some serving - only ever had a sketchy idea about. And your thoughts might turn to the veterans in your own family. Recording a veterans video honors old soldiers and creates a valuable family history documentary. And when you take the trouble to send that veterans video to the Veterans History Project at the Library of Congress, that old soldier's story will take its rightful place in our Nation's Archives. You will have saved an Old Soldier - for ever more.